We are frequently asked, "Why take a Southwest Safaris Air Tour?" The answer is easy and time-proven. Southwest Safaris Airventures offer real value. Our quality air tours give the adventure traveler the most dramatic, comprehensive, cost-effective, and environmentally-sensitive way of seeing the Great American Southwest. There is no greater thrill than lifting off the ground at sunrise and soaring over pristine landscapes that stretch to all horizons. No form of land travel can offer the perspective necessary to grasp the overall grandeur and interrelationships of the natural world. Traveling by car alone, one can drive a hundred yards away from a canyon and have no idea of its presence. Traveling only by jeep, it may take all day to see the view on the other side of a mountain. Using a raft by itself is a great way to explore the bottom of a canyon, but a limited means by which to get the big picture on the earth’s evolution. By combining multiple vehicles of transportation with light aircraft, Southwest Safaris provides tour members with a synthesis of motion, view, and time unavailable by surface conveyance alone. The energy efficiency of air travel is undeniable. A one-day Southwest Skyfari reveals more than one could see in weeks of driving, saving the cost of expensive meals, lodging, gas, and auto rental fees. Sophisticated travelers realize that time is money. 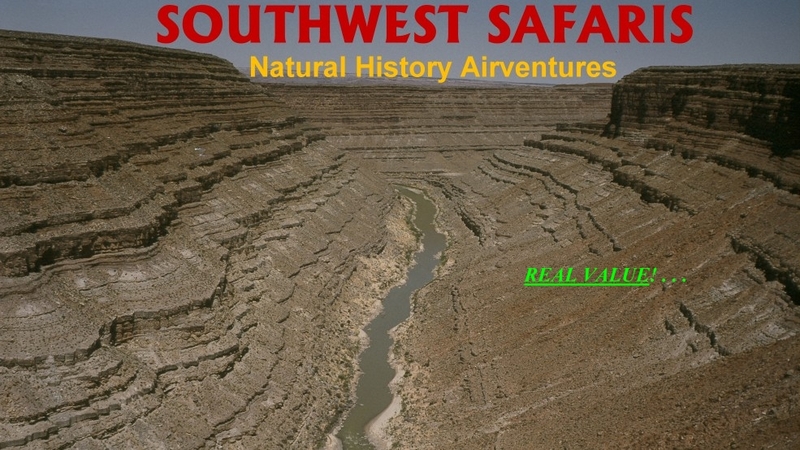 A Southwest Safaris natural history expedition can easily cover 100,000 square miles of area and 800 million years in a single day, offering an introduction to geology, archaeology, ecology, and history comparable to a college-level field trip. We leave no footprints behind us and require no paved roads or concrete overlooks. Nature is enjoyed with freedom and safety as we explore remote and rugged landscapes from the comfort of our special safari aircraft, maintained to the highest standards and constantly inspected. Southwest Safaris is a FAA-approved air carrier and approved FAA/NPS air tour operator, in business since 1974. We welcome the opportunity to share with you one of life’s premier experiences! Prices that include everything as stated - no hidden fees. Fuel surcharges may apply. Please call us, toll free (800-842-4246), for consultation on your next wing safari. We offer many itineraries not listed on this web site, including custom scenic charters from point to point within the American Southwest. Adventure travel is our specialty. SOUTHWEST SAFARIS = YOUR BEST VACATION INVESTMENT!